Is Meat Part of a Natural Diet? If sweeping statements are to be made and funding collected to defend their dietary guidelines, the scientific proof from an unbiased agency needs to support them. Most of what I treat in the Emergency Department is diet related. We have eaten ourselves into a state of sickness, and it is fueled by misinformation. I am considering becoming vegetarian, and am also into natural/alternative medicine. 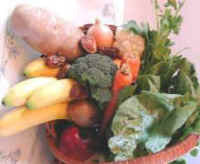 Some of the natural health practitioners that I talk to are members of the Weston J. Price Foundation, which advocates a natural foods diet which includes meat. They insist that the protein and quality nutrients the body needs cannot be obtained from a vegetarian diet, and that vegetarians are subject to weakened immune systems and disease. How true is this? Congratulations on your consideration of moving towards a plant-based diet and exploring alternative medicine. I was personally unfamiliar with the Weston A. Price foundation, and used this opportunity to conduct my own research. It is my impression that the foundation promotes foods based on farming practices from yesteryear. They advocate 'raw milk' and 'grass fed' meat consumption. Their website has firm statements regarding the benefits of these products, yet the scientific data is lacking. Furthermore, it is unrealistic to believe that such farm practices are indeed sustainable for the Earth's ever growing population and their increasing demand for meat. Animal agriculture is incredibly wasteful, in terms of land, energy, fossil fuel, and water resources and will not be able to sustainably feed the 9 billion people expected by 2050. Consumption of animal fat and protein is irrefutably linked to hypertension, high cholesterol and cancer. The principles of the Weston J. Price diet are founded on belief and entitlement, not scientific proof. They also hold the belief that soy is linked to a weakened immune system, which is incorrect. Again, where is the proof? They are outraged that prisoners are being fed soy-based protein, calling it 'cruel and unusual punishment', and are claiming the prisoners are suffering health ailments as a result. They do not mention what ailments they are suffering from, and how this connection was determined. Most of what I treat in the Emergency Department is diet related. We have eaten ourselves into a state of sickness, and it is fueled by misinformation. At work, I carry my copy of The China Study by T. Colin Campbell PhD and show it to my patients. The China Study is the largest study ever conducted on human nutrition. Dr. Campbell entered this field of study with great trepidation. He hails from a family of farmers, who consumed milk and meat. And the food they were consuming was prior to the age of factory farming- the diet that the Weston A. Price foundation advocates. The genetic variability is minimal in China, as there is not a lot of immigration. Dr. Campbell was able to remove genetics from the equation of health ailments (there is a widely held belief that the diseases we suffer from is genetically determined) and focus on diet. His findings are nothing short of alarming. The book also specifically addresses the issue of 'quality protein'. Plant protein has been proven to be superior to animal protein. A plant based diet provides humans with all of the nutrients they will ever need to lead a healthy life, with a statistically lower likelihood of developing a host of ailments, including cancer. This book will empower you and enlighten you.